Are you ready to replace your old and outdated patio furniture? If so, you need to check out the selections from Design Furnishings. Their Premier packages are fresh and contemporary. Any one of them will give your outdoor living space an immediate facelift. Take a look at some of the great features the Premier Packages have to offer. We have many options to choose from within the Premier packages. So, you will be able to find something to fit your needs whether you are trying to furnish a small patio or a large back yard. If your space is on the smaller side, you can choose one of the packages that features just two chairs and a table. If you are looking to fill up a bigger space, there are packages that contain 20 pieces, so you will have ample seating room, tables, and other accessories when you decide to throw a party. The furniture in the Premier packages is all made out of the highest-quality synthetic wicker. It is made of polyethylene, so it will stand up to all types of weather. This feature is essential for furniture that will always remain outside. The wicker is also hand-woven and high-density. So, it can withstand not just daily use, but also any possible misuse and abuse a family can throw at it. The aluminum base on this furniture contributes to its durability. The frames are made of high-quality, non-corrosive aluminum that will not rust, even after years of exposure to rain and snow. The frame also allows the furniture to be maneuvered around with ease, so you can easily redecorate at your every whim, but it won’t blow away when the wind begins to blow. There is a lot to love about the cushions that accompany the Premier Package. First, the washable and zippable cushion covers come in a wide array of colors ranging from muted neutrals to vibrant brights. You will have no trouble at all finding something to suit your tastes that fits into your decor. But, cushions are about more than appearance. They feel and look luxurious. So, you will not have to worry about them diminishing the look of your outdoor living area. In fact, they will enhance it greatly. The cushions also come with a two-year warranty that protects against fading. So, if you do encounter a problem, you will be able to get your cushion covers replaced easily. Foot levelers are a great feature that is often overlooked. The foot levers adjust the height of the furniture for uneven surfaces. So, you will not have to worry about your deck or patio getting marred by the feet. Any Premier package you purchase will be delivered to you in its fully-assembled state. So, there is no worry if neither you nor your mate is a handy person. As soon as your furniture arrives, it will be ready to use! The Premier packages are all reasonably priced. Outdoor furniture of this quality usually has a price point that only the wealthy can afford. But, the Premier package is priced so it can be purchased and enjoyed by anyone. It is also important to keep your outdoor furniture clean. Thankfully, the synthetic wicker furniture in the Premier packages can be cleaned by following a simple method. If you live in an area that experiences harsh winters, there are precautions you can take to keep your wicker furniture safe from the elements will help to prolong its life. 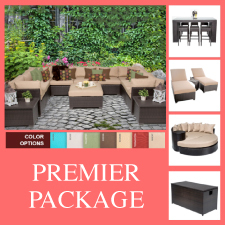 Now that you know a little bit about the Premier packages that are offered by Design Furnishings, take a look at the website and check them out. You’ll have no trouble finding one that perfectly fits your needs! If you would like more information, visit our website and speak to one of our friendly and knowledgeable staff at Design Furnishings, today!